The Recognition every artist deserve! We would greatly appreciate if you are interested in participating with an artist profile in 'WHO IS WHO IN VISUAL ART!' the new Masters of Today (MOT) art book project for contemporary artists, art galleries and art museums, to get on the most research-driven list of the worlds best active collectors and others who uses Masters of Today (MOT) art books series to permanent collect and review contemporary art. Unique style artists are mostly welcome to sign for inclusion. To further increase public awareness and appreciation of the art, a quality book will document the contemporary artists in Art Addiction exhibitions, contests and events and contains artists’ biographies, and images of the art. The book is edited, published by Petru Rusu, gallery manager, art editor, publisher and fine artist (MFA) who has been dealing with art for more than 35 years. Petru is also known as the founder of Masters of Today (MOT) publishing, World Of Art magazine (publishing) and Art Addiction Gallery (gallery online since 1992). TOTAL: 6-pages US $ 1,390. TOTAL: 10-pages US $ 2,780. Take 3-Page & Get 17-pages Free. TOTAL: 20-pages US $ 3,990. In order to complete your participation please download and fill the PDF Application Form included here and provide the publishing materials requested below so our creative team can get back to you with a layout alternative in the book as soon as possible. Ensure that your are including your most iconic works of art and information. • up to 40 works: email us 300 dpi/ 23 cm/ 9 in JPG /TIFFs files. • The works details: title, year, technique and size. • Up to 500-1000 words of critic essay, writing or statement. • The place of residence and work. You may provide the image files along the information by email attachments or by WeTransfer that is a free service to send big files from A to B.
Hardcover 24x24 cm | 9,5x9,5 inched, up to 300 pages, museum quality offset printed on 200 grams art paper. The first print run 25,000 copies. The book electronic version /eBook is provided by email to our over 120,000 art art resources, subscribers and collectors. Each artist included in in the book will receive 3 copies at the shipping and handling charges based on the delivery option chosen. Additional copies are available at the handling and shipping charges. Masters of Today (MOT) Contemporary Artists Art Books Series is the most collect-worthy art collection completely with new artists and works of art produced at the present period in time, document and analyze the contemporary art on museum quality offset printed, hardcover books and eBooks, to price and love over 1000 contemporary artists with more than 5000 works of art. Visual artists' advertisements in Masters of Today (MOT) Contemporary Artists Art Books Series are Tax Deductible. The Internal Revenue Service allows professional artists and art galleries to deduct the costs of promoting work, including print advertisements in art books and catalogs, as business-related expenses. Amazon.com Search inside our books at Amazon.com http://www.amazon.com/-/e/B0039GVAVK. eBray. Look inside MOT books electronic version of MOT printed books Click to view in eBook format. Masters of Today (MOT) and World Of Art (WOA) is one of the most vibrant artist-led publishing with international artists’ authors. Masters of Today (MOT) published artists are selected for outstanding achievements in fine arts and art exposure. Their work is among the best and spreads new ideas. Masters of Today (MOT) Contemporary Artists Art Books Series includes the mixture of established and emerging arts professionals available to show and collect. In addition to the fine artists we publish we have many relationships in the art field and we are happy to assist artists in finding there place in art and art history. 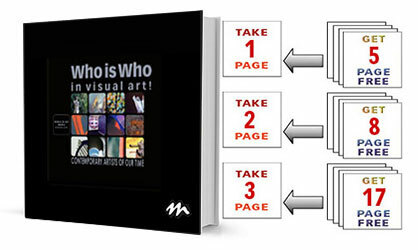 Who are using Masters of Today (MOT) and World Of Art (WOA) publications are also used by leading art museums, art biennials, cultural centres, art fairs, curators including among others: The Museum of Modern Art New York; The Guggenheim Museums in New York, Las Vegas, Bilbao, Berlin and Venice; Museum Ludwig, Cologne, Germany; TATE Modern and TATE Britain United Kingdom; Moderna Museet Stockholm, Sweden; Castello di Rivoli Museo d’Arte Contemporanea, Torino, Italy; ARC /Musée d’Art Moderne de la Ville de Paris, France, are also used bySTARKE Foundation Germany; Venice Biennial; Manifesta; Art Basel, Art Forum and many others. At MOT we are all experienced graduate active fine artists and we have over 35 years experience in fine art, creative layout, art publishing and offset typographical production. We provide museum-class publication services to fine artists, art companies, art organizations, and art lovers worldwide. We specialize in collectible, collective, museum quality art books and individual numbered and signed bibliophile limited editions art books. Our clients are fine artists, art museums and art galleries worldwide. All Masters of Today (MOT) art projects represent the values of an art object professional in every aspect, unique created publications for collectors, galleries, museums, bookstores, libraries and art lovers, an overview of our contemporary art. Selling works of art through art books is easy.